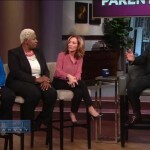 Just in case you missed author, playwright, Marine Veteran, speaker, and mom, Sulondia “Sue-Ham” Hammond, on the Steve Harvey Show, you can watch it now via the video below. Watch both of my appearances below: If you’d like to Book Sue for a speaking engagement, radio, and or TV interview, please send your requests to BookSueHam@yahoo.com Learn how to get on TV and Radio, please CLICK HERE. ..